Omega's RTD sensors with M12 connections are designed to provide for easy and efficient installation or removal of these sensors for periodic calibration, troubleshooting or replacement. Gone are the days of having to pull extension cables from cable trays in order to calibrate or replace the sensor, now you simply disconnect the sensor from the extension cable saving cost and downtime. The Omega PR-26 RTD is a flexible and robust temperature sensor made with 316L Stainless Steel housings and sheaths for strength and corrosion resistance. The probe stem is made from mineral insulated cable which produces a sensor that can be used to 500°C, and can be bent (except for the first 2 inches of the tip) to fit your application. For use in thermowells, the PR-26SL Spring-Loaded version of this sensor is the preferred solution. 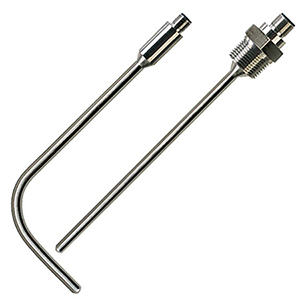 The PR-26SL design includes a non-threaded PR-26A style probe with a self-gripping spring and 1/2NPT threaded fitting to insure that the probe will contact the bottom of the thermowell bore without damaging the sensor. This insures that the sensor length will always be a perfect fit for your thermowell. See the PR-26SL page for additional information. Standard Probe Diameters: 1/4" and 1/8"
Note: For lengths other than 6", change “0600” in model number to required length and add $1 per inch or 25mm to the price. greater than 6" (example: 9" = 0900, 41/2" = 0450).